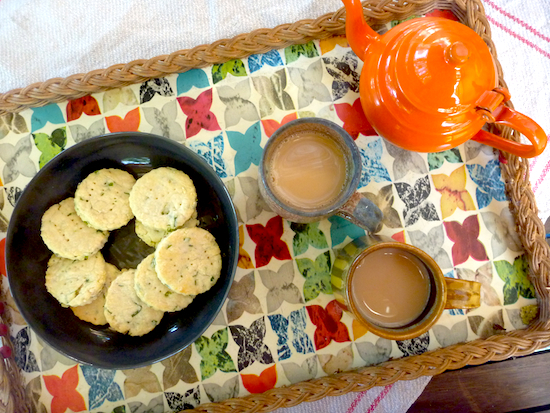 I love dunking biscuits in tea but I get a bit sick of sweet biscuits, so these Indian khara biscuits are perfect for a savoury dunking experience. Indian vegetarians don’t eat eggs – their baked goods tend to be ‘eggless’ but not vegan, as dairy is used. Some Indian cooks use vegetable shortening in these biscuits – which makes them crispier – but I’m not a big fan of shortening. If you want a vegan version, I would suggest using a light olive oil instead of butter. 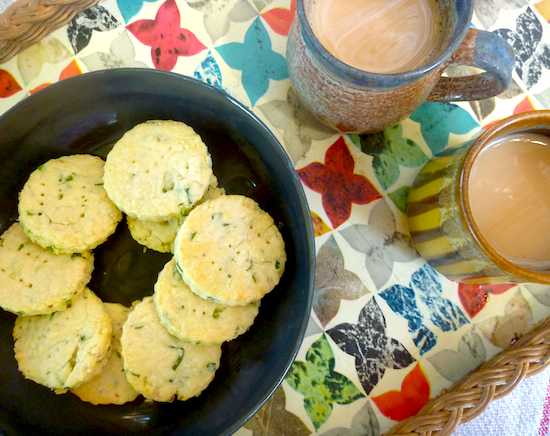 These are a great afternoon tea snack and particularly good when paired with spiced sweet chai. They’re simple to make, keep well in a tin for up to a week, and are incredibly difficult to stop eating. You can mix and match the spices and herbs a bit: some recipes use whole cumin seeds but I prefer the tart, savouriness of ajwain seeds. 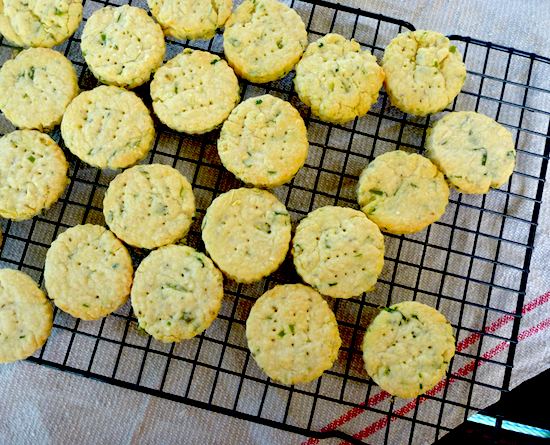 If you don’t have green chilli on hand, you could substitute black pepper but I do love the green flecks of coriander and green chilli in these shortbreads. Sift or whisk together flour, baking powder and salt. Add ajwain seeds and stir through. Rub butter through flour, then mix through finely chopped herbs and green chilli. Gradually add yoghurt a teaspoon at a time and gently knead the mixture together until it coheres into a stiff dough. Roll out dough until about 3 mm thick. Cut into desired shapes, place on baking sheets, prick shortbreads with a fork and brush tops with oil. Bake in oven for 10–15 minutes until lightly golden around the edges. Be careful not to overcook the shortbreads. Remove shortbread from trays and allow to cool on racks.